Our new Secretary of Education, Betsy DeVos, is rich, white, and a proselytizing supporter of the Christian religious right. DeVos is also an outspoken champion of school vouchers. These two things are not coincidences. While voucher proponents will tell you, and some may even believe, that their push for vouchers is a push to make sure all children have the opportunity to get a great education, the real benefactors of school vouchers are the rich, the white and the religious right. What are vouchers exactly? School vouchers come in many forms and since the general public is typically opposed to voucher schemes, politicians who favor them have come up with a variety of Orwellian doublespeak names for them like Opportunity Scholarships, Education Choice Scholarships, or the Education Savings Accounts. Another way states have found to get around calling vouchers vouchers is the scholarship tax credit. These schemes allow individuals and corporations to direct their tax monies to private institutions who then use the money for scholarships for students. The idea behind vouchers, originally suggested by economist Milton Friedman in the 1950s, is that the competition for students carrying vouchers will improve all schools, that children stuck in "underperforming" schools will find a way out through a voucher system, and that parents will get to exercise choice. 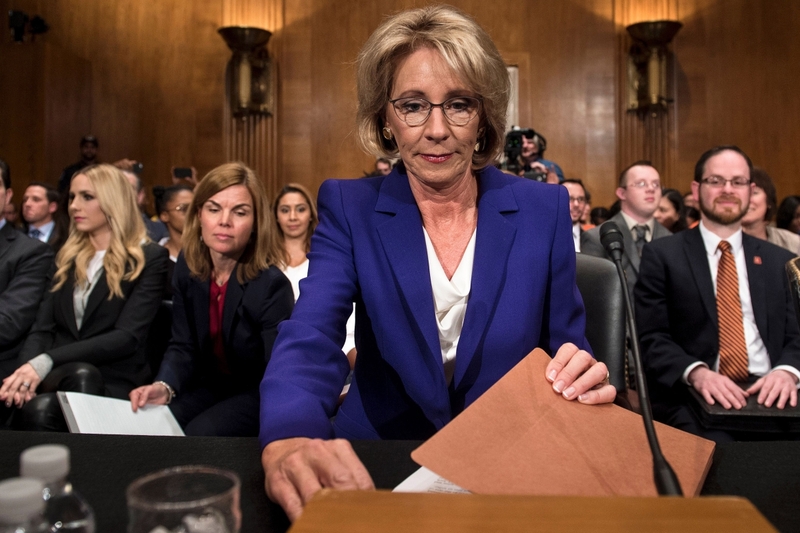 DeVos claims that voucher opponents are foes of change and champions of the status quo. I hope to show that it is the voucher schemes and the DeVos' of the world who are championing the status quo - the status quo where the rich get richer and the poor get poorer as we see happening in this country right now. What are the problems with vouchers? Do vouchers achieve the supposed goal of improving educational opportunity for low-income and minority children? Many have cataloged the issues, but here is a quick list with some links for further reading. So why the push for vouchers? Because vouchers are very good for the rich. If the rich can sell vouchers as the cure for educational inequality, they may be able to get people to ignore the real reason for public education struggles - income inequity. If the rich really want to improve schools, they need to put their money on the line. If the rich are really interested in helping poor school children they need to invest - through higher taxes (or maybe just by paying their fair share of taxes), not unreliable philanthropy, in improved health care, child care, parental education, pre-school education, public school infrastructure and on and on. This will be expensive, but we can do it if the wealthy would show the same dedication to the "civil rights issue of our time" with their wallets as they show to harebrained schemes like vouchers. So vouchers are good for the rich, but they are also good for the racist. Voucher schemes were born in the racist south in the 1950s right after the Brown v. Board of Education struck down school segregation. After that ruling, many states passed voucher schemes to allow white parents to send their children to private schools and take taxpayer money with them. Many children, black and white, are still feeling the negative impact of this racist response to desegregation. Today, vouchers have similar effects on schools. Vouchers may not provide enough money for low-income and minority students to attend private schools, but they may well provide enough money to subsidize attendance for their slightly more affluent white neighbors. Hence, vouchers exacerbate school segregation, especially considering that white parents are likely to send their children to schools where the majority of the children are white. This limits the incentive for majority white private schools to seek true diversity. So if you are a racist, a segregationist, school vouchers will be very good for you. Meanwhile, your "choice" is denying the choice of a good neighborhood school to your minority neighbors. Vouchers schemes are a windfall for religious schools. In Indiana, former Governor Mike Pence, yes that guy, oversaw one of the largest school voucher programs in the country. Almost everyone of the "voucher schools" in Indiana is religious. According to Mother Jones , the Indiana voucher program provided a publicly funded bailout for the Catholic schools that were struggling under declining enrollment and increased expenses. The Indiana choice law prohibits the state from influencing the curriculum of religious schools so schools are free to use public money to teach creationism, the Bible as literal truth, or to use textbooks that provide a positive take on the KKK. Again, this is no accident, Pence, like DeVos, is a champion of the religious right. In a recent article entitled Dismal Voucher Results Surprise Researchers as DeVos Era Begins, the New York Times chronicled the most recent research on school vouchers. The Times cited research from 2015 in Mike Pence's own Indiana that showed that public school students who used vouchers to transfer to private school showed significant losses in mathematics achievement. They also cited a recent Louisiana study that showed negative results for students in both reading and math. Finally, they cited a study from last June by the choice friendly Thomas Fordham Institute that found in Ohio that "students who who use vouchers to attend private schools have fared worse academically compared to their closely matched peers attending public school." Now I do not expect research to trump ideology in a DeVos led Department of Education, so the only recourse people who really care about public education, like public school teachers and administrators, parents, and students have is to resist - to resist loudly, clearly and persistently over the foreseeable future. The good news is that the resistance can be driven, not just by emotion and passion, but by actual research and genuine facts. A group of students in the Richardson, Texas school district showed us all how this can be done. They reduced choice champion, Texas Senator Dan Huffines, to a sputtering, vitriol spewing idiot by simply asking a few pointed questions about choice. Huffines was all in a, well, huff, because a student dared to point out that his beloved voucher scheme would not work out well for the majority of children in the district. It is interesting to me that so many of the champions of school choice are opponents of reproductive choice. I think it is because the whole argument for school choice is not really about choice or educational quality - it is about control. Control of the mind and control of the body. Wealthy proponents of choice from DeVos to the Waltons to Donald Trump want to control the masses. Public education is a messy place where kids are taught to think critically and where teachers join unions to insist on a decent salary and good working conditions. Thinking citizens are harder to control. Teacher unions get in the way of doing education on the cheap. Who knows, public school educated future Walmart employees may insist on unionizing. Some of those inquisitive public school kids may discover that DeVos and her husband built their fortune on a business model that is a scam. If, on the other hand, the wealthy can control the public funds going to education, there is lots of money to be made from for-profit schools. The drive for school vouchers is one in the same with the drive to turn the vast majority of the children in the country into willing conscripts in a new America - an America that is an oligarchy of the 1%.